This winter's frigid temperatures are making it a brutal few months Toronto's bird populations. This winter's frigid temperatures are making it a brutal few months for Toronto's bird populations. The Toronto Wildlife Centre says it has been the busiest winter in history for the rescue charity. It is seeing an increase of water birds in need of assistance. "Water birds are having great difficulty coping with the freezing temperatures since they rely on open water for their very survival," according to the centre. Of particular concern are Grebes, close cousins of loons. These birds can’t even walk on land, so obvious difficulty arises when bodies of water freeze over. Grebes typically winter on Georgian Bay, but it too has frozen solid for the first time in almost 20 years. 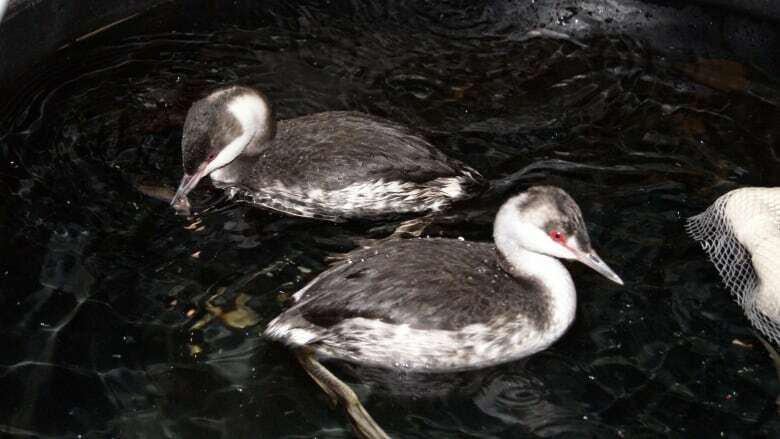 Already in the first three days of this week, the centre has admitted 11 red-necked grebes. Already in the centre are 78 bats, 4 swans and many more animals. "Our staff are exhausted, working long hours every single day, at a time of the year when we can usually get a bit of rest. And our food bills are much higher than the centre’s donations can cover," said Nathalie Karvonen, the Toronto Wildlife Centre’s executive director. The centre is urging the public to call 416-631-0662 or visit TorontoWildlifeCentre.com if they come across birds or other wildlife who may be in trouble, sick or orphaned this winter.